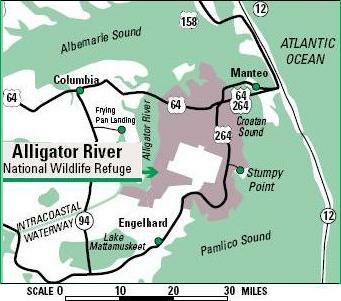 On our fourth day of vacation (Tuesday, September 18) Bob and I went to the Alligator River National Wildlife Refuge, located on the Dare County Mainland only a few miles from Roanoke Island. We had hoped to see a bear. All we saw was a turtle crossing the road, one great blue heron and lots of butterflies. Bob enjoyed the off-road driving. We decided to make our way back to U.S. Route 64 when we had no signal on our cell phones and the GPS didn’t show us on a road. What “roads” we did travel and were on the GPS looked like tractor routes through a hayfield! Could this possibly be Alligator River? By the way, there are alligators in this wildlife refuge. I saw photographs of them on the Internet. We didn’t see an alligator in person though. Hi Linda, your trip photos are bringing back many memories of my trip there. We also went to this Alligator River refuge also hoping to see a bear. I was a little upset all we were seeing were hunters. I think we went the wrong time of year. Loved the photos, especially the turtle. I enjoyed reading about your trip and seeing the beautiful photos, Linda.